Elderly residents from Stirling and Siddons buildings in Tavistock Street were moved out by the GLC, with £30 to cover expenses. Their flats were boarded up to encourage others to leave, to make way for the 4 lane road and Waldorf hotel extension. CGCA organised picketing, but soon realised that it was not enough. 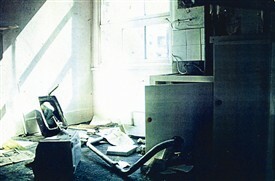 Trentishoe mansions, a solid Victorian block near Cambridge Circus, was decanted as leases expired, and vandalised beyond habitable use by GLC workers. CGCA members squatted despite the appalling conditions, preventing demolition for the new widened road and office blocks. Maurice Angel’s costumier on Shaftesbury Avenue let them in through the shop. Sandringham Buildgings West and Newport Court, two Westminster housing estates on Charing Cross Road, were emptied of residents and stripped out. CGCA members squatted there too, then went to court over the eviction process, buying valuable time as the builders waited in frustration. Fire gutted the Odhams Press building on the east side of Endell Street after it was sold to a developer. Designs for a massive new building by Richard Seifert, the architect of Centrepoint tower, appeared in the press just the following week! It was the largest in a series of many fires that mysteriously broke out in the area. 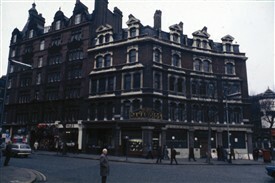 It is estimated that 700 residents, about a quarter of the permanent population, were moved out of Covent Garden over 2 years. By 1972 land was changing hands at £5 million per acre. 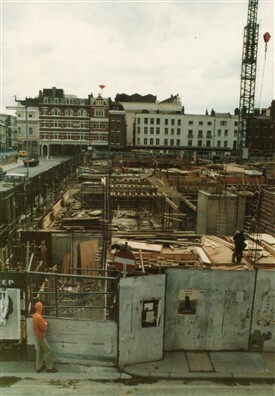 Another developer, unable to gain planning permission to refurbish the old ‘Kitchener and Khartoum’ flats at the top of Drury Lane, instead demolished them to follow the GLC’s plan. 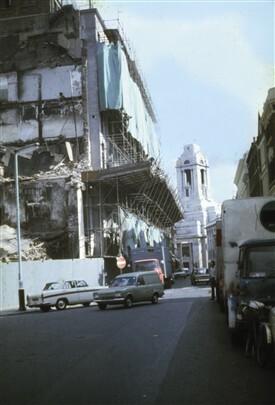 A sharp-edged block rose high above Shaftesbury Avenue, together with an opening to the sunken road and an upper walkway - evicting CGCA from its temporary Drury Lane office in the process. These concrete elements remain today, as a vestigial warning of what might have been the fate of the whole of Covent Garden. 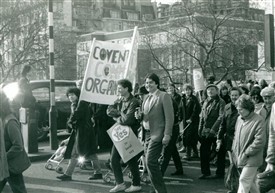 CGCA worked hard to publicise underhand tactics and keep the momentum of the campaign, even famously marching on the home of Lady Dartmouth in Mayfair when she was Chair of the GLC’s Covent Garden Development Committee. 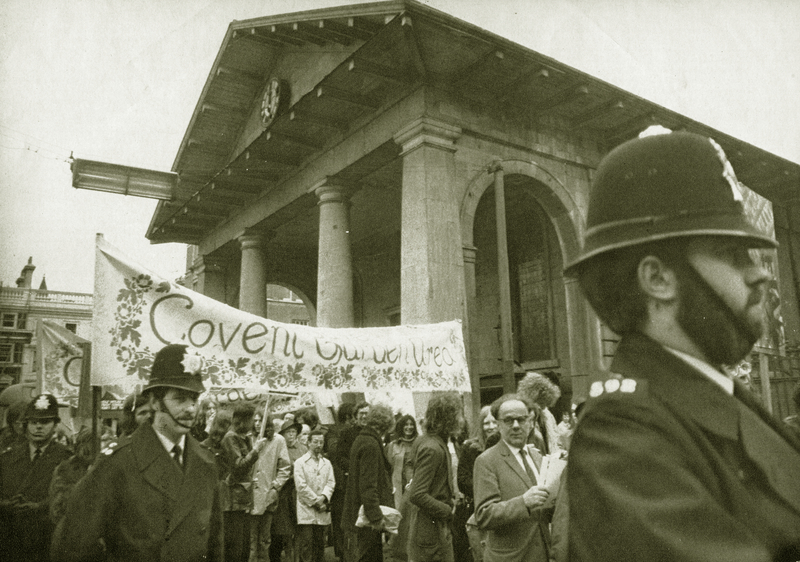 When the planning inspector’s report eventually came out in support of the plan in July 1972, local people were outraged and redoubled their efforts. The ‘Covent Garden Workshop News’ was published, a penny broadsheet to keep everyone informed. CGCA teamed up with the actors union, Equity, and famous people joined the struggle. 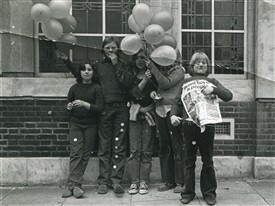 The issue became international, with television crews coming from as far afield as Australia. Protest grew.